We have recently launched Riesen Milk in Sweden and Denmark. 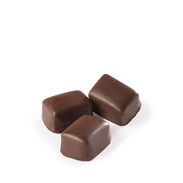 Our ever popular dark Riesen is now available for the first time in a delicious milk chocolate version. RIESEN is now available in more than 50 countries and is as successful today as it has always been. Show that you've got what it takes: the new promotional campaign "Chocolate for serious experts" featured large-scale posters and newspaper advertisements. A new look for even more taste: RIESEN was given a new, modern packaging design in 1999. Thanks to intensive product research, the new RIESEN provided an even more intensive taste experience and became even more chocolatey. The advertising campaign said it all: "Just try it!"